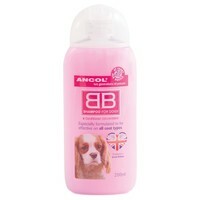 Ancol BB Dog Shampoo is a gentle shampoo that is suitable for both dogs and puppies. Specially formulated for all coat types, this fantastic shampoo is perfect for the regular washing of your pooch. With a pleasant baby lotion scent, this shampoo nourishes and revives your dog's coat back to its full soft and shiny quality, while leaving your dog feeling beautifully clean and fresh!